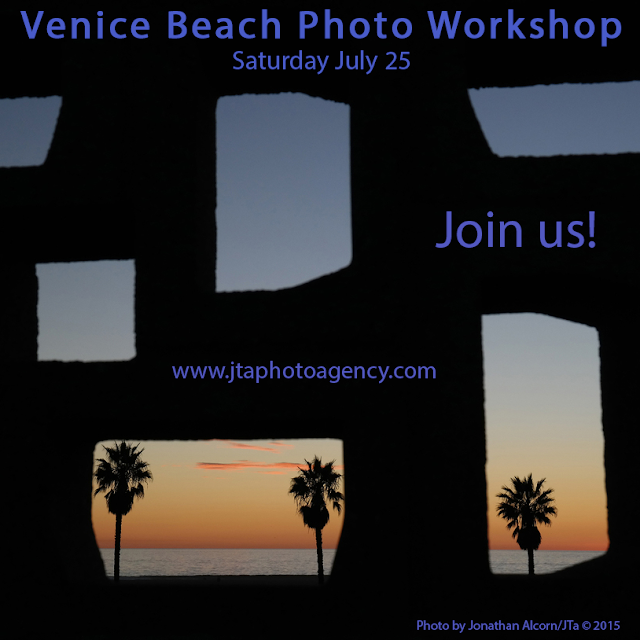 On Saturday July 25th, we are offering a daylong photo workshop in Venice Beach. This workshop will be hosted and led by Jonathan Alcorn and Ted Soqui with Nick Ut as our special guest. Between the three of us, we have about 100 years (yep, over a hundred years) of combined photo taking experience. With our workshop, we will motivate and inspire you to improve your photographic vision. Most of the class time will be spent in the field taking photos and learning. This is a hands-on in the field workshop where you we will show you how to use your camera as a powerful photographic story telling tool. We will begin the day with a slideshow and instruction on what we will do throughout the day. Nick Ut will also speak about his photography experiences with a moving slide show, it will inspire you. We are also adding a outdoor portrait component to the workshop. You will learn to utilize available light, and compose your camera to make wonderful and incredible portraits. This will be fun and good for those who enjoy travel photography. Bring your portfolio or online address if you would like a private portfolio review of your work. We will also have some of Samsung's latest NX mirrorless cameras for you to try out for the day. LaRon Vincent of Samsung USA will be on hand to show you how to use these amazing cameras. This class is good for travelers or folks who want to learn to shoot in a photojournalistic style. All abilities are welcome. We enjoy working with all levels of photographers. Class size will be limited to around 12 people. We will start at 11am and will shoot until dusk, that’s when we get some of the best photos of the day. The techniques and approaches we will teach you are the exact same ones we use. You will explore some of Venice Beach’s most interesting people and locations with us. We will cover lots of ground and see some amazing places including the Venice Beach Boardwalk, Venice Skate Park, canals, and the sandy beach by the breakwater. Hopefully by the end of the class, you will be more comfortable in meeting and photographing some of Venice’s most interesting sites and people. A camera with fully charged batteries. Lots of battery power this is a daylong class. I prefer using a DSLR type of camera. Digital cameras are good to help us evaluate your progress. We will be chasing the decisive moment and DSLR style cameras are best for that. Overall, bring your most comfortable camera. Lenses I suggest bringing, a wide-angle 16mm up to 28mm, and a med-telephoto lens. If you have a zoom lens, make sure it covers a wide a semi-telephoto focal length (24-105mm range). Also a 50mm to 85mm lens for the portrait class. I like shooting with a longer zoom like a 70-200mm, but any medium zoom will be awesome for this class. Leave your flash and tripod at home. Lots of memory cards for your cameras. We do not delete images during the class. Hat and sun block. Money for snacks. Wear very comfortable shoes with rubber sole shoes. Sandals and flip-flops for the end of day, when we walk on the beach. A small notepad with a pen. Always great to take notes and exchange email address with. Try using one our mirrorless cameras from Samsung USA. An incredible guided view of Venice and the environs with two world-class photojournalist as instructors with our special guest, Nick Ut. Snacks and coffee, tea, or water at the beginning of class. A delicious lunch meal in Venice Beach. Entrance fees to any attractions we enter. We can help with some phone and camera charging, but would prefer if you took care of that before the workshop. It should be warm or even hot during the day. Dress appropriately. We always make the most of what weather we get, that’s part of the class. Be prepared with a selection of appropriate clothing for the day. A small jacket or hoodie will be good for sunset time. A hat for during the day is a must. Sun block is always a good idea. Venice Beach in July usually is a great time of year. The early evenings tend to chill down a bit. Include your name and address. Will be able to sign you up over the phone and answer any questions you may have. If you are flying in from out of town, we can pick you up from the airport. and his clients range from Bloomberg Philanthropies, LA Weekly, Time Magazine, and television shows like “The Closer” and “Major Crimes.” Ted’s work is also in the permanent collection of the Autry Museum of the West. His work can also be found at the Robert Berman Gallery in Santa Monica. Ted’s photo interest range from US politics, political movements, and wild fires. Ted's new book "Snap Cackle Pop" is now available on Amazon.com. project that documented their daily lives, and then curated the images leading to a successful photo exhibition of their work benefiting the Alzheimer's Association. In addition to his interest in portraiture and breaking news photography, Jonathan is currently working on a long-term photo project documenting his home base of Venice Beach. He is also a member of Samsung Camera USA's Imagelogger program. Special guest Nick Ut will be going us. Nick Ut is a photojournalist with the AP. He is best known for photographing a young girl, Kim Phuc, running down a street in Vietnam after a napalm strike on her village by US forces. The photo was credited in helping to end the war in Vietnam and it won him the Pulitzer Prize in photography. Nick still works in the Los Angeles bureau of the AP and continues to take amazing photos. Join us and make some new friends at our class. Full refund up to 3 weeks before workshop date. Refund for credit towards a future workshop if canceled anytime afterwards.